Michelle Obama Reveals She Used IVF Following Miscarriage - celebrities life, news, blogs, photos, gossip etc. Sharing her truth. Michelle Obama revealed that she once had a miscarriage and that she and her husband, former President Barack Obama, relied on in vitro fertilization to conceive their two daughters, Malia, 20 and Sasha, 17. The former First Lady, 54, opened up about her fertility struggles during a sit-down with Robin Roberts, excerpts of which aired on Good Morning America on Friday, November 9. 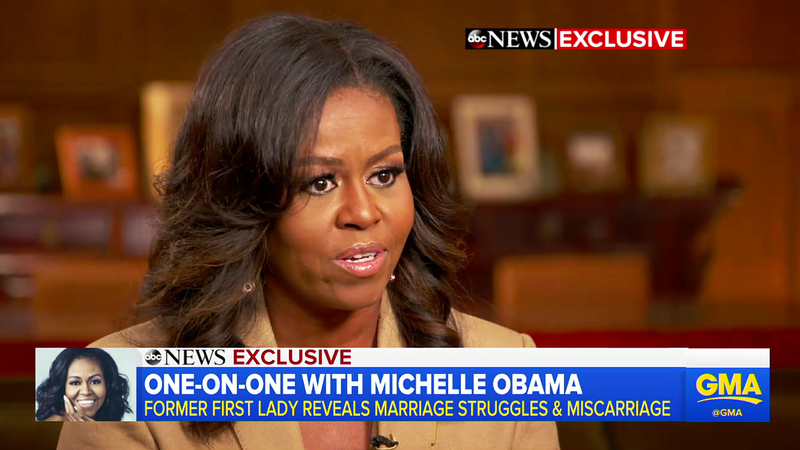 For starters, Michelle said she “felt like [she] had failed” when she had a miscarriage weeks after becoming pregnant. “I didn’t know how common miscarriages were because we don’t talk about them,” she explained. The Becoming author is candid on this topic for a cause: She wants to get other women talking about their own health. “I think it’s the worst thing that we do to each other as women, not share the truth about our bodies and how they work,” she told Roberts. Her full interview with Roberts will air during a primetime ABC News special, Becoming Michelle: A First Lady’s Journey with Robin Roberts, on Sunday, November 11, at 9 p.m. ET.